Mikaela Shiffrin is poised to step to the forefront of the American ski team with Lindsey Vonn not on this year’s Olympic team. EAGLE-VAIL, Colo. — Given a rare rest day at her family’s Rocky Mountain home in early December, Mikaela Shiffrin sat cross-legged on a couch, tucking her bare feet beneath baggy sweatpants. Away from autograph seekers, cameras, and sponsors, she seemed more typical teenager than skiing prodigy. She talked about the television show “Glee,” double-checked with her parents on details of her childhood in New Hampshire and Vermont, and tested out her new German-speaking skills. All of those within earshot — her mother making lunch, her father reviewing travel plans, her agent typing on a computer at the kitchen table — understood how life would change in the coming months. Shiffrin, too, was well aware of the approaching Sochi Olympic spotlight, the one that will portray her as Lindsey Vonn’s heir apparent and the next superstar of US skiing. Still, the 18-year-old sounded more matter-of-fact than anxious or awestruck at the prospect. Shiffrin called the Games “the greatest sports competition of all-time, but first and foremost two more races.” She came across unfazed by gold-medal expectations and confident about her own accelerated path. From the moment Shiffrin made her World Cup debut at age 15 in March 2011, she has stayed true to that approach. She reached her first World Cup podium in December 2011, then won her first World Cup race, a night slalom, in December 2012. Less than three months later, at 17, she claimed the World Championship slalom title. Shiffrin capped her 2012-13 World Cup campaign with the season title in slalom, racking up the most points in her best event. At nearly every turn, she astonished the ski world. On the eve of the 2014 Winter Games, that may be an understatement. Shiffrin is a favorite to win gold in slalom and a strong contender for the gold in giant slalom. Still, as much as Shiffrin saw no reason to wait for success, a Sochi Olympic debut was never part of some grand plan. “I knew when I was watching Vancouver [in 2010] that Sochi was the next Olympics and I was thinking, ‘Gosh, that would be cool,’ but I wasn’t setting a date,” said Shiffrin. Yet the timing could not be more opportune. For American audiences almost worshipful of precocious sports talent, the Games provide a perfect launching pad for the country’s most promising Alpine skier since Vonn, a gold medalist and 17-time World Cup title winner. Plus, Vonn’s absence because of knee surgery creates a face-of-the-Games void. Shiffrin, with her long blond hair and easy smile, could fill that void, especially if she ends up on the podium. The competition that brought Shiffrin back home to Colorado was the women’s World Cup stop at Beaver Creek Mountain. Her family’s home sits in the shadow of the ski resort, a couple miles from the Raptor racecourse where Shiffrin made two giant slalom runs Dec. 1. It was a perfect day for ski racing: bright blue skies, temperatures in the mid-30s, and, for Shiffrin, the loud, cowbell-ringing support of a hometown crowd. It was also a perfect setup for the teenage phenom — the end of a Vonn-less weekend when other US women performed poorly on home snow. 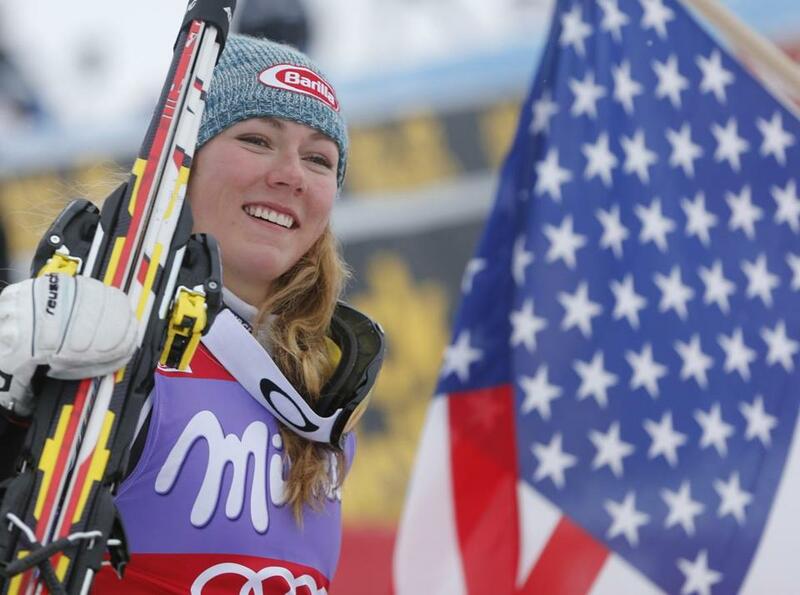 Everyone looked toward Shiffrin to salvage the weekend with a strong performance. While her father took photos from alongside the course, her mother Eileen waited at the finish with family and friends. Nearby, fans waved cardboard photos of Mikaela’s face, cut out like masks. When the real Mikaela made her way down the mountain in a series of seemingly effortless, crisp turns, the crowded roared. Her upper body remained largely still as her shoulders pushed aside each gate. When skiing her best, the 5-foot-7-inch Shiffrin said, she often hears a song in her head, sometimes simply a catchy beat that gives her turns rhythm. The night before the giant slalom at Beaver Creek, she sat down at the piano in her bedroom and made a “mash-up mix” that combined “Battle Scars” by Lupe Fiasco and Guy Sebastian and “The Scientist” by Coldplay. The mash-up played the next day in her head. As she gathered speed at the bottom of her second run, her first giant slalom podium was within reach. She earned silver, finishing behind Sweden’s Jessica Lindell-Vikarby by nine-hundredths of a second. Then talk of two medals in Sochi began. 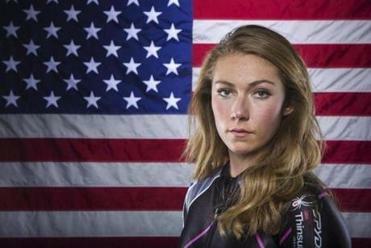 Shiffrin enters the Sochi Games as the No. 1-ranked slalom skier in the world and the No. 6-ranked giant slalom skier. The mantra was an early lesson on how to stay balanced and turn properly. Born in Vail, Mikaela started skiing there with her father, her mother (an accomplished masters racer), and her older brother Taylor, who competes for the University of Denver. She quickly fell in love with the big mountains and the powder. But at 8 years old, her family moved to New Hampshire, forcing Mikaela to adjust to icy conditions in the East and much smaller slopes. She remembers days and nights spent skiing near her home in Lyme, N.H., at Storrs Hill, Dartmouth Skiway, and Whaleback Mountain, riding rope tows and Poma lifts. “I was having fun with my friends,” said Shiffrin. “It was kind of a social thing at that point. And it was while racing at small New England ski areas that Shiffrin first began to dream big. From that point, Mikaela worked toward her debut, quickly rising through the ranks and reaching her goal two days before her 16th birthday. For Shiffrin, goal-setting and training have been the biggest draws to competitive skiing. She highlighted that her “passion for racing” started out the first time she trained seriously for the sport. She likes setting goals for each run and learning something new from each practice session. That work ethic combined with natural talent, a nontraditional emphasis on training over racing, and instruction from coach Kirk Dwyer at Burke Mountain Academy in East Burke, Vt., help explain her quick ascent. “Why would you want two runs in competition when you can get 15 runs in training?” asked Shiffrin. “I don’t need racing experience to be able to race well. I learned that because Kirk had me stay back from a lot of races and train. “We kept it pretty simple, with the belief that skiing is simple,” said Dwyer. “But it’s complex at the same time because there are a lot of different pieces. You break it down to simple pieces and you work on mastering those, then you put the pieces together. At the heart [of Shiffrin’s training] was carving [turns] and balance. An emphasis on practice and thoughtful progress toward mastery also fit with her parents’ preference for light race schedules and her father’s philosophy about athletic development. Jeff Shiffrin talks often about the time investment needed to progress from competency to mastery. Based on what he has read over the years, champions, whether reaching the grandmaster level in chess or winning gold medals in skiing, require 10,000 to 20,000 hours of time invested in their sport. To reach the top level of ski racing, Jeff said, it takes more than talent — that “dedication, hard work, access to the mountain, and quality coaching” are crucial. At Burke, Shiffrin found quality practice time and all-around coaching. Not only did she work on the technical details of ski racing, but she paid particular attention to the mental aspects under Dwyer. Most important, she learned to keep a positive outlook. Given her World Cup schedule the last couple years, Shiffrin’s time on the Burke campus was limited to roughly a few weeks in the early fall before the first European race of the season and two months of spring term. Much of her high school classwork was done via e-mailed assignments; one summer was spent studying chemistry eight hours a day. Away from Burke and overseas, Shiffrin has received a different kind of education, learning about the pressures and demands of the highest level of ski racing. With celebrity status in Europe and an impressive roster of sponsors, she is a teenager negotiating a very adult, very competitive world. Her mother has been a welcome travel companion, confidante, and study partner through it all. Shiffrin notes that her mother “knows exactly what mood I like to be in to race my best and she knows how to get me there.” Sometimes that might mean doing word searches in a lodge before a start. On other occasions, they might just sit together and stay quiet. Open and unpretentious, Shiffrin acknowledged that the first European races of this season — a sixth-place giant slalom finish in Soelden, Austria, and a first place in slalom in Levi, Finland, that netted a pet reindeer as a prize — were a relief. “I was a little bit worried before Soelden and Levi that maybe I was going in the wrong direction, like maybe I feel like I’m faster but I’m not compared to anybody so I don’t actually know,” said Shiffrin. If she comes away from Sochi with a gold medal or two, it would not be a fluke, either. And it could give a worldwide audience a good look at ski racing’s future.